We are updating students with outlines of English essays so they can easily write essays for their test exams of NTS, PCS and CSS. 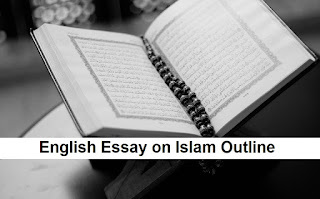 If you are searching for Islam English Essay outline then read below as we have updated this page with new Essay on Islam in English outline. 2. Background in which Islam dawned in Arabia and its revolutionary impact in bringing peace and prosperity in Arabian peninsula. e. In peace and war time. d. Were the wars offensive or defensive? i. Was the Muslim state really threatened when the attack was launched by Muslims? ii. Were the Persians and roman empires hurdles in the peaceful propagation of Islam? 8. Can the acts of Muslim rulers be equated with the concepts of Islam? 9. Can the acts of a Christian ruler be always equated with Christianity? 16. When Islam is so peaceful then why the non-Muslims blame it? b in the garb of mujahids there might be criminals in order to save their skin, the criminals have ranked themselves with the mujahid. a. are they really conversant in the teachings of Islam? b do the great scholars of Islam support them? c. do the masses support them? d. in the present Muslim world the laws being practiced are un-Islamic? e for establishing an Islamic state can they kill their brother Muslims and fellow human beings? f. what kind of state they want to establish? g will it cater to the needs of modern times? h. are all the Muslims support the terrorist or mujahids? I in labeling all the Muslims instead of a few mujahids what does the west want? J does west really believe in clash of Islam and the west? o. Can the Islam not liberate the diversified world? If you need more outlines and essay writing help then you can comment below and stay active on www.TaleemWala.com or just share this article with your fellow students and we will update you with more guides on essay writing in Pakistan.